The Azores are a group of volcanic islands located in the middle of the Atlantic Ocean, about 2.5 hours - 3 hours by flight from Lisbon. Since their colonization by the Portugese seafarers in the 15th century, the Azores have been part of the Portugese Empire and a strategic transit point on the Trans-Atlantic sea and air route. Today, the Azores are an autonomous region within the Portugese Republic, and part of the European Union. Horta, the biggest town on the island of Faial, is served by TAP Portugal and SATA (the regonal airlines of the Azores) via Lisbon or Ponta Delgada (on the island of Sao Miguel). 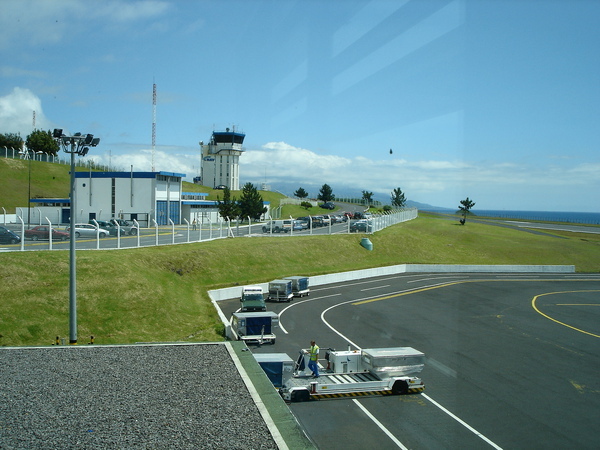 The airport at Horta has a relatively short landing strip, which means the thrust reversers were immediately put into action as soon as the SATA Airbus 320-200 touched down on the runway. The airport of Horta is located in the village of Castelo Branco, about 10km outside of Horta town centre. There is a inter-village bus service that stops at a bus stop on the main road, right outisde the entrance to the airport. The control tower at Horta airport. On the right-hand side of the photo is the airport runway. 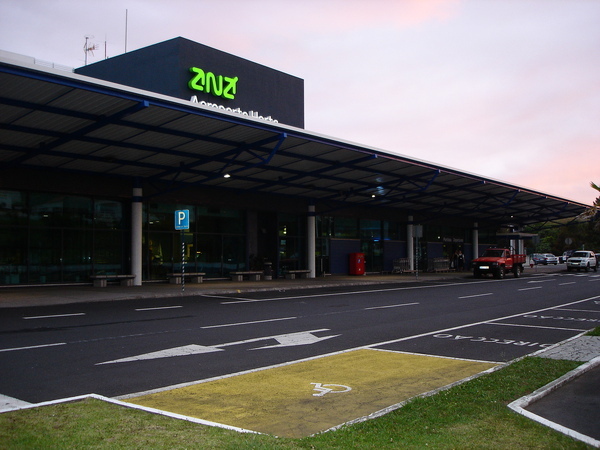 The airport building with both the Arrival and the Departure Hall located on the same level. 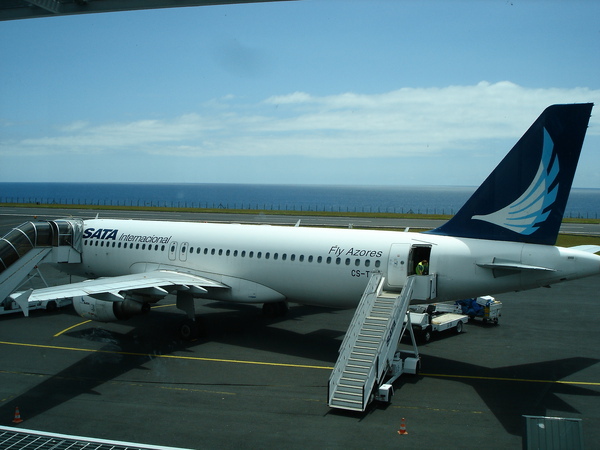 For those interested in visiting the Azores, SATA operates direct flights from Zurich, Frankfurt, Amsterdam, London, Dublin, Copenhagen to Ponto Delgada on the island of Sao Miguel. From there, you can change flight to all other Azorean islands. Direct flight to Angra do Heroismo on the island of Terceira, and Horta on the island of Faial, from Lisbon are available with either TAP Portugal or SATA. 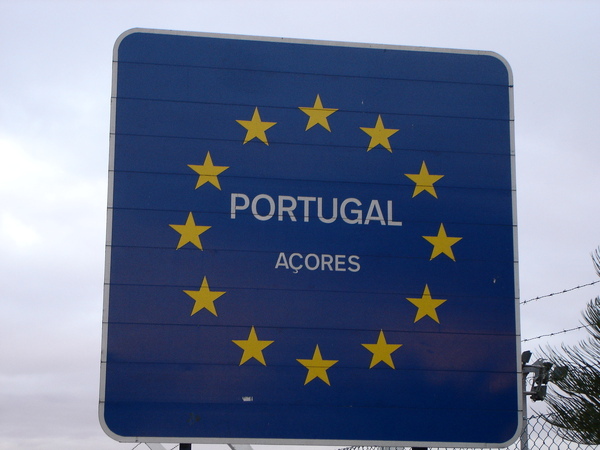 Entry Requirements: The Azores, being part of the Portugese Republic, are an integral part of the European Community and part of the Schengen Areas. SATA International also operate direct flights using Airbus 310s from North America (Boston, MA. and Oakland, CA. in the US, as well as Montreal and Toronto in Canada) to Ponto Delgada on the island of Sao Miguel. From there you can change flights to other Azorean islands. BY Ferry: Transmacor (http://www.transmacor.pt) operate year-round ferries and catamaran service between the islands of Faial (Horta), Pico (Madalena, Sao Roque do Pico) and San Jorge (Vela, Calheta).